Most pirate captain's were democratically elected by the ships crew and could be replaced at any time by a majority vote of the crewmen. For example some captains were voted out and removed for not being as aggressive in the pursuit of prizes as the crew would have liked. And others were abandoned by their crews for being a little to bloodthirsty and brutal. They were expected to be bold and decisive in battle. And also have skill in navigation and seamanship. Above all they had to have the force of personality necessary to hold together such an unruly bunch of seamen. This left the captain of most pirate ships in a rather precarious position and some were in truth little more then a figurehead. Generally speaking, he was someone the crew would follow if he treated them well and was a fairly successful pirate captain, but could be replaced if enough of the men lost confidence in him and felt he wasn't performing his duties as well as he should. However, despite all this the captain was frequently looked upon with respect as a knowledgeable leader of men. 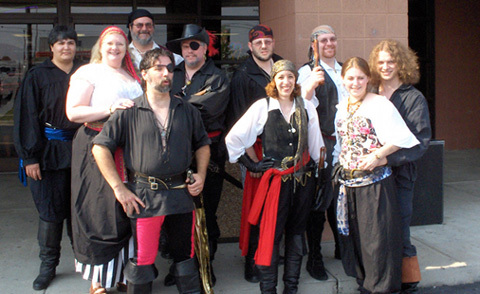 And the pirate crews historically appeared to have followed his judgment in most matters. There are surprisingly few detailed descriptions of what the pirate captains looked like, and those we do have are rarely flattering. Most seem to have adopted the clothes of naval officers or merchant sea captains, which in this period followed the style of English gentlemen. During the Golden Age of Piracy, most British and Anglo-American pirates delegated unusual amounts of authority to the Quartermaster who became almost the Captain's equal. The Captain retained unlimited authority during battle, but otherwise he was subject to the Quartermaster in many routine matters. The Quartermaster was elected by the crew to represent their interests and he received an extra share of the booty when it was divided. Above all, he protected the Seaman against each other by maintaining order, settling quarrels, and distributing food and other essentials. This was the officer who was in charge of navigation and the sailing of the ship. He directed the course and looked after the maps and instruments necessary for navigation. Since the charts of the era were often inaccurate or nonexistent, his job was a difficult one. Many Sailing Masters had to be forced into pirate service. The Boatswain supervised the maintenance of the vessel and its supply stores. He was responsible for inspecting the ship and its sails and rigging each morning, and reporting their state to the captain. The Boatswain was also in charge of all deck activities, including weighing and dropping anchor, and the handling of the sails. The Carpenter was responsible for the maintenance and repair of the wooden hull, masts and yards. He worked under the direction of the ship's Master and Boatswain. The Carpenter checked the hull regularly. If leaks were detected the Carpenter would place oakum between the seems of the planks and wooden plugs in holes to keep the vessel tight. He was highly skilled in his work which he learned through apprenticeship. Often he would have an assistant whom he in turn trained as a carpenter. The Master Gunner was responsible for the ship's guns and ammunition. This included sifting the powder to keep it dry and prevent it from separating, insuring the cannon balls were kept free of rust, and all weapons were kept in good repair. A knowledgeable Gunner was essential to the crew's safety and effective use of their weapons. On a large ship there was usually more than one Mate aboard. The Mate served as apprentice to the Ship's Master, Boatswain, Carpenter and Gunner. He took care of the fitting out of the vessel, and examined whether it was sufficiently provided with ropes, pulleys, sails, and all the other rigging that was necessary for the voyage. The Mate took care of hoisting the anchor, and during a voyage he checked the tackle once a day. If he observed anything amiss, he would report it to the ship's Master. Arriving at a port, the mate caused the cables and anchors to be repaired, and took care of the management of the sails, yards and mooring of the ship. The common sailor, which was the backbone of the ship, needed to know the rigging and the sails. As well as how to steer the ship and applying it to the purposes of navigation; he needed to know how to read the skies, weather, winds and most importantly the moods of his commanders. Other jobs on the ships were surgeon (for large vessels), cooks and cabin boys. There were many jobs divided up amongst the officers, sometimes one man would perform two functions. Mates who served apprenticeships were expected to fill in or take over positions when sickness or death created an opportunity.